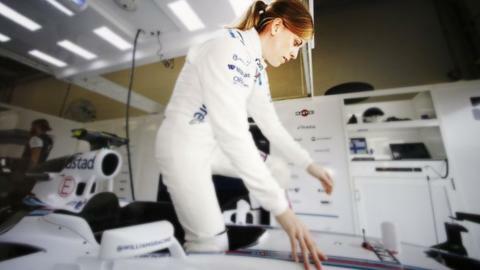 Susie Wolff dreamed of becoming a Formula 1 race driver from the age of 13. Yet for the determined Briton, who began in karting at the age of eight, there were few role models to look to for inspiration. In the entire history of the sport, only five women have entered a grand prix weekend. Just two - Maria Teresa de Filippis in the 1950s and Lella Lombardi in the 1970s - actually started a race. Unperturbed, Wolff set off on the path that she hoped would end with her one day sat behind the steering wheel of an F1 car, taking her place alongside the elite of motorsport. After competing in a number of different categories of racing, including the highly rated German touring car series, she entered Formula 1 in 2012 with a trial at Williams, which developed into a full-time test role. Wolff edged closer to her ultimate goal, taking part in four practice sessions at race weekends in the years that followed. When Valtteri Bottas injured his back at the Australian Grand Prix back in March, it finally opened up the possibility of the Briton getting the chance to compete in her first grand prix. But when Williams ruled out promoting Wolff from her role and signed Adrian Sutil as cover for their drivers instead, it sent a blunt message to Wolff that, even if the opportunity to race arose, she would be overlooked. "It was the harsh reality that the dream wasn't going to come true," she said when announcing her retirement from motorsport earlier this month. "I always said that as soon as I couldn't get any further I would stop and that time has come." Wolff might not have realised her childhood dream, but what she has done is inspire others. After her retirement, messages of appreciation flooded Twitter, some speaking of daughters wanting to go racing, others saying she inspired them to pursue their own personal life ambitions. "I dared to be different," said Wolff. "I want to inspire others to do the same." She can be proud that she has done exactly that.